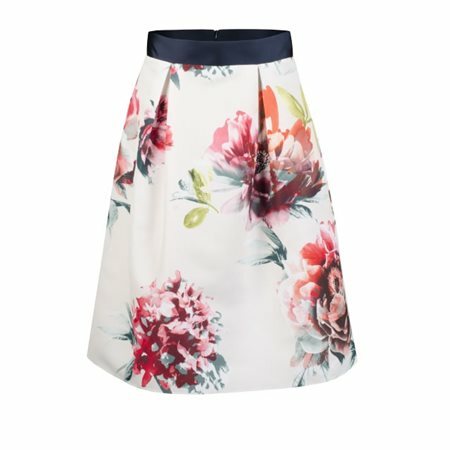 This gorgeous skirt by renowned Irish designer Fee G has been created using a warm ivory fabric featuring a bold floral print in orange, pink and green. The full bodied skirt is fully lined and gathers at the waist with a broad navy waistband giving the wearer a petty silhouette. The skirt closes at the back with a concealed zip and falls to just below the knee for a graceful, elegant look. Fee G has also designed a beautiful Bardot top in navy to accompany this skirt, this top is also available at Jonzara. If you are interested in purchasing please give one of our very friendly staff a call on 028 9182 1440 and they will advise you on the fit of this particular garment.